There can be no worse nightmare for a parent. The knock on the door, the ashen faces of the people forced to break the news, the world turned upside down by the completely unexpected. When a young athlete, fit and full of life, collapses suddenly on the sports field and cannot be revived by paramedics, their death is devastating not only for their family but for their friends, team mates and the usually unflappable emergency services professionals who attend such a death. Paramedics and ambulance staff deal with incidents nearly every day that require great resilience, but none is more distressing than the death of a child or a teenager. Why do Young Athletes Die Suddenly? The most common cause of the unexpected death of a young athlete is sudden cardiac death syndrome. This is a catch-all term used to describe what happens, rather than the underlying cause. The young person concerned usually has an undetected heart problem that causes no signs of symptoms, even when they have been training and doing active sports prior to their death. A possible reason can be a heart valve abnormality, a congenital defect, a problem with heart rhythm, none of which affect the normal functioning of the heart most of the time. At some point, the problem becomes critical during a burst of cardiovascular activity and the heart stops. The incidence of sudden cardiac death in young competitive athletes aged between 12 and 24 is low. Estimates say that 1 young athlete in every 28 000 people in this age group succumbs to sudden death due to natural causes. This is a hot topic within sports and fitness in Europe and in the USA and other countries. The heart problems that lead to sudden death are rare in this age group, so there has been much discussion about whether such a screening programme would be cost effective. 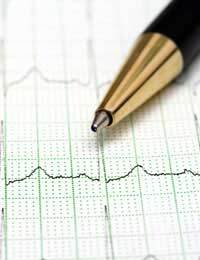 It may be that an electrocardiogram and other tests could detect a minor heart murmur, or a problem with the heart that could then be treated, but these sorts of tests are very expensive. The vast majority of them would be wasted because 27 999 young people out of 28 000 would be fine. Nevertheless, in 2005, guidelines issued in Europe and the US did call for more EEG 12-lead tests on young athletes. There have also been suggestions that automated external defibrillators should be made available at sporting events so that the cardiac arrest of a young athlete could be treated immediately, with potentially lifesaving consequences. Availability and cost are the main issues and experts also point out that sudden cardiac death due to an underlying heart abnormality can occur anywhere, not just on the playing field. In the past, there have been several recommendations to try to set up screening for the most competitive young athletes to try to target preventative measures to the young people most at risk. These have been widely ignored but it would make sense for athletes and their families to have to fill in a detailed medical questionnaire before starting a programme of rigorous fitness training and competition. This may reveal a family history of heart problems that could flag up the need to check out that athlete more thoroughly. Some type of less expensive screening is needed so that athletes suspected of even slightly elevated risk of sudden cardiac death can then be referred for an ECG and other tests to rule out any problems before their training begins. Any unexplained muscle weakness or fainting in a young athlete, whether on the sports field or not, should be taken very seriously and should be investigated as soon as possible. Any symptoms of heart disease in other family members who are young adults, or a diagnosis of any genetic disease that impacts on heart function should also be regarded as important warning signs of the risk of sudden cardiac death syndrome in young athletes who may be nieces, nephews or cousins. If the unimaginable happens and a young athlete does collapse, emergency first aid, including resuscitation techniques until paramedics can arrive is the best way to save a life. First aid training should be a priority in any sports team or fitness club with several people able to perform mouth to mouth resuscitation. Very detailed , easy to navigate , lot's of interesting topics. Carry on the good work!